A Division bench of the Kerala High Court comprising Chief Justice Ashok Bhushan and Justice A.M. Shaffique has directed the Thiruvananthapuram Development Authority (TRIDA) to cut less than 10 trees in the area leased to them to construct a shopping complex and plant thrice the number of trees to maintain sufficient green cover. The Court was hearing a Writ Petition challenging an order of the State Government by which it granted permission for leasing out 2 acres of land to TRIDA for construction of a bus-bay and shopping complex out of 5.5. acre land of the Government Central High School, Attakkulangara, Thiruvananthapuram. The Petition prayed for quashing the order of leasing out of land. It also demands that an Environment Impact Assessment is conducted by an accredited agency, before proceeding with any project concerning the Government Central High School, Attakkulara. The Petition contended that the decision of the State Government transferring the 2 acres of land to TRIDA is illegal. It was submitted that Section 5B of the Kerala Education Act, 1958 contains the restriction on alienation of property of Government schools. In view of this prohibition, the State Government could not have transferred 2 acres of land of the Government school. The Court however ruled that Section 5B is not applicable to the facts of the present case as the school was not vested in any local authority. The Court noted that the number of students in the school was only 55. It hence accepted the Government’s proposition that the remaining 3 acres of land is sufficient for the school. Further, the petition contended that the construction of bus-bay and commercial complex shall necessitate cutting of large number of trees from the school compound, which shall affect the environment. The Government on the other hand submitted that they need to cut less than 10 trees only for the new construction and that the institution can be directed to plant three times the number of trees that is to be cut. TRIDA had also submitted that it shall construct 10 class rooms in lieu of the building which shall be demolished. Further, construction activities in any way will not cause hindrance to the working of the school. 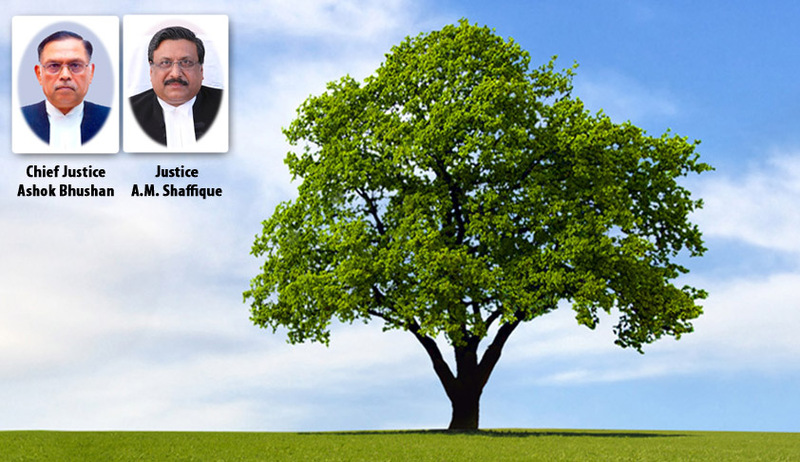 The Court found the transfer of land valid, but directed that TRIDA shall cut less than ten trees in the area. It was also directed to plant thrice the number of trees, which are cut in the area leased out. It was also directed to construct ten class rooms as undertaken in its statement filed in the Writ Petition.